Does anyone else find themselves shocked that July is here? Suddenly it's mid-summer and I have no idea how that happened. Before I get started on my fitness recap, I just wanted to let you know that we are among those suffering and whining without power (and, in our case, water). As a result, I have not been able to do much blog visiting, although I am trying to return all blog comments, at a minimum. I miss reading your posts, but I hope that we will have electricity reinstated very soon (particularly since it is soooooo hot without a/c) so I can catch up. My incredibly awesome aunt and uncle were kind enough to loan us their generator yesterday, so at least we won't be losing all our chicken and beef from the deep freezer - we did lose some food, but our deep freezer has held strong throughout. Now, about running! I had a good month of running in June. But you know what happens to me every summer? I tend to stop cross training. This year I'd hoped that wouldn't happen, but it seems to be a pattern for me, and I guess it isn't that horrible to stop doing the weights for a couple of months each year. After all, I keep up with my running, and that's the main thing. I just can't ever seem to enjoy the weights, and by summer each year it's hot and sticky and I lose my motivation. No doubt I'll pick it back up this fall. 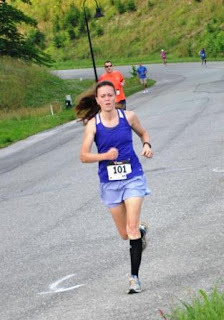 I ran one race in June (Sundown Classic) and it was a night race, which was a bit of a change for me. It was hot and hilly, but I really enjoyed it. Just before the halfway point of the race I realized that I was having fun! In a 5K! I feel like I ran pretty well too, considering the heat, the fact that it was a weird time of day for racing, and the hills. The best part? The race was a benefit for my local humane society, which desperately needs the money. A friend of mine organized the race (she did a wonderful job!) and her husband took this picture of me. They were kind enough to share, so I finally have a picture of me running to put on my blog. My time was 23:50 and I placed second in my age group. Do you find yourself falling into workout patterns throughout the course of the year? Do you just roll with it, or do you fight those tendencies? Happy 4th of July! Stay cool folks, and if you happen to have power where you live, take a moment to appreciate how wonderful electricity really is! Hope you get power very very soon. Happy Fourth! Great photo you have shared this a.m. and wonderful that the Humane Society benefited from the race. Here in Atlanta, the Peachtree Road Race begins shortly. Glad you have the generator to keep your meat safe during this time w/o power. Wow! Well done on the race. I love running myself and run around 8km 3 times / week. Been doing that for years and still loving it. I hope your power comes back soon or maybe you could just come to South Carolina! Happy Fourth of July Lisa. I hope you get your power on soon. I know how that feels we went through the ice storm and had no power for a week in the winter. Congrats on the race, it sounds like you did an amazing job. I am also shocked that it's July, and it seems that I become a total slacker in the summer. Keep up the great work on your running and will keep my fingers crossed your electricity is back on soon. That is tough, but at least your freezer is safe! I hope today is the day you get back your power! I feel for you. I know how it is, though this time, we do have power. We are incredibly grateful for it. Wish I could share it with you! I have 5 months left to get ready for a 5K. Yikes! Way to go, Lisa! Love this photo. So sorry about your power. I'm sending prayers out to you. May things be back to normal sooner than later. In addition to electricity, water is also wonderful. Some folks don't know that when you have a well, it is powered by an electric pump. So no power means no water. As in no flushing! I have a new appreciation for both after days without electricity. Also, since our fridge blew up when the power came back on, I would like to express gratitude for refrigerators that don't blow up when power is restored. Hi Lisa, I have a harder time getting my walking in when it is so hot outside... BUT--most of the year, I do okay (walking--not running). You look awesome out there, Lisa. Good job!! I hope you get the power restored soon. Yes, we really appreciate what we have more when we lose it. Good deal, 2nd. That is great. Happy 4th rest. Oh, man - that must be miserable without power! But at least your aunt and uncle came to the rescue (for the freezer). Glad you had a fun race! I have been there done that without electric. Not Fun!! Hope it comes on soon. We don't know how much we miss it until it is gone. Great running picture of you! It reminds me of the movie where they say Run Forrest Run! I hope you get your power soon. It's been a hot summer so far I am not surprised it's July I am ready for fall. Happy 4th. I hope you had a nice day. Awesome photo of you! Had I known you were without power I would have offered you our generator since we only needed it for one day and then our power came on. Next time let me know... hate to think of anyone suffering without fans and cold food in the fridge! I'm glad you got some back up power! Feeling lazy and terribly unmotivated here. I could blame the heat, but I fear it's something greater right now. You are awesome! That is a great action shot!! I am hoping to get signed up for a few races in the next year. My fitness has taken a huge sucker punch the past two years but I am making progress now! Oh geez, that stinks about the power but I'm glad you haven't lost everything. So glad you got a snap of you running! You look great in the photo! You are definitely keeping fit!